How excited are you about the holidays? :) I am SO MUCH! And I have a FREE holiday training for you next week, so keep reading or click here to sign up right away! Once I started working, I found this season more and more stressful to the point where my body almost physically shut down. I worked at Apple, in an actual Apple Store until 2015. Even though I am a huge fan of the brand and love everything they do, retail is just not the environment I was meant to be in forever. If you've ever been to an Apple Store in December, you may know what I'm talking about. On busy Saturdays before Christmas, we sometimes got up to 5000 visitors in one day. In ONE freakin' day! Now imagine a 5-day work week in December with this amount of people. Overwhelm, anybody? It makes me dizzy to just even think about it. I felt like a machine operating at full speed. Non stop. I am not blaming anyone here. It's not that I didn't like my job. In fact, I loved and still love Apple, I thrived on organizing, working with the team, helping customers with their questions and desires, and developing our employees. But it was the incredibly fast paced environment and the endless amounts of people that my mind and body had to deal with every single day in December. My body was constantly in fight or flight mode, my cortisol was high and there was almost no time to recover from the stress. On my days off, I just slept through, my body and my brain were so tired. My energy was all over the place, and unfortunately, I didn't know how to balance myself back then. And did I feel healthy in my body? I was physically and mentally exhausted. When Christmas came, I usually got sick and only wanted to stay in bed for a couple of days. NOW HERE'S WHAT I LEARNED! Luckily, over the last few years of working with my chakras, becoming a health coach and totally nailing meditation, I learned how to work with my energies, how to recharge, and stay balanced every single day. If only I had known this back in 2011 :) It would have been so helpful! This holiday season, I am sharing everything I've learned with you! Yayyy, goodbye overwhelm, goodbye stress! Hello blissful jingle bells and tea times! 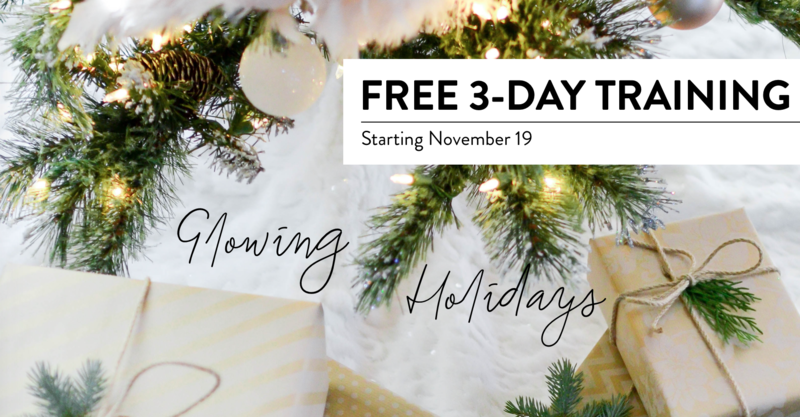 FREE TRAINING: LET'S GLOW THIS HOLIDAY SEASON! On Monday, we're starting a 3-day training series where I will be sharing my TOP holiday tips with you! If you're ever feeling anything close to how I felt, then this training is for YOU! Can you think of a friend who needs exactly this? Send them this link, so they can join you next week: bit.ly/glowingholidays.